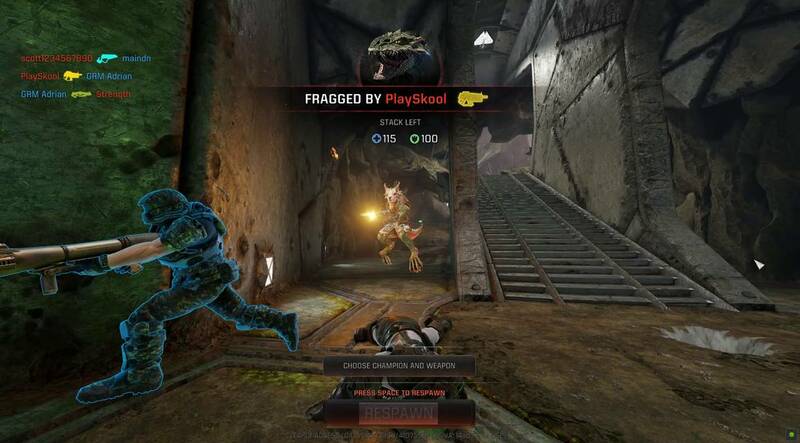 Matches in Quake Champions relies on quick reflexes, knowledge of power ups and mastery of its Champions. If you've never heard of or played a Quake game before, let's get you up to speed. 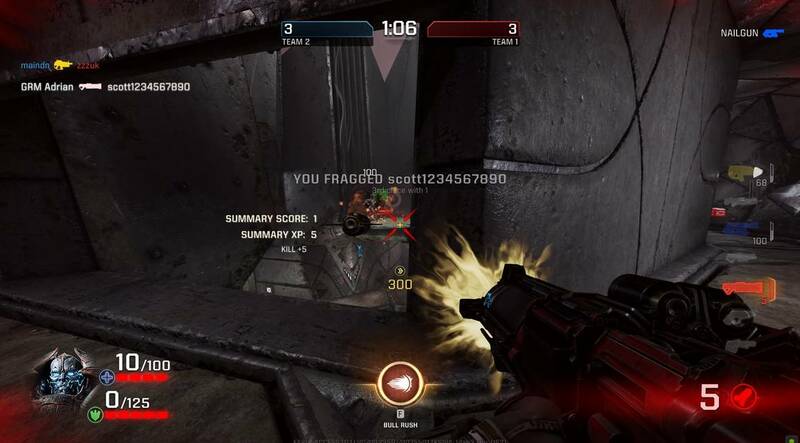 Quake has been instrumental for the First Person Shooter (FPS) genre, and many of today's shooters are in some way, inspired by the early Quakes due to its groundbreaking action matches and over the top heroes you play as in the early years. 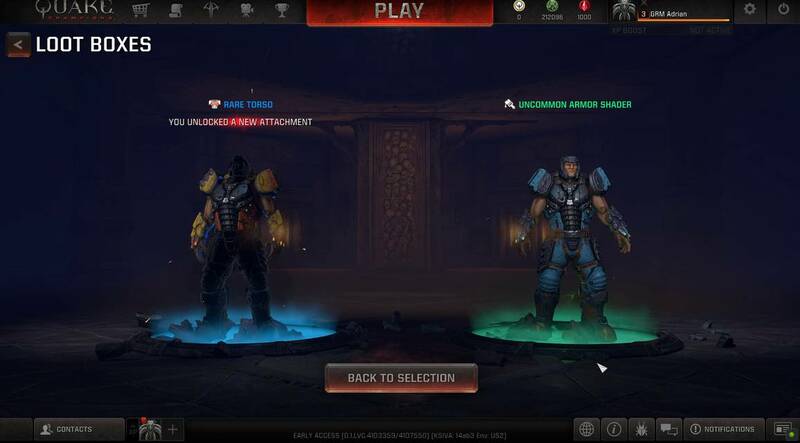 Today, Quake Champions is a modern-day incarnation of the Quake franchise featuring gorgeous graphics, excellent gameplay and a larger than before Champion roster, all wrapped up in a free to play offering for the masses. As a new player to Quake, there are a few main things you need to know. 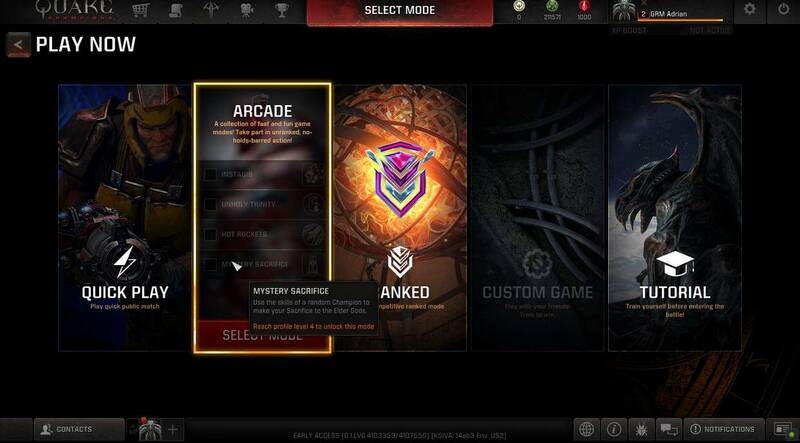 Firstly, is that the more you play, the more game modes you will unlock. Therefore, all players will only have access to Team Death matches at the beginning. Before jumping into one, you'll get to select your Champion. Champions are the avatars you play as. Each comes with a distinctive look, background lore and a unique set of weapons and skills. Down the line, you can customize everything from the type of weapon to the color dyes and even outfits. Free players get to pick Champions which rotate weekly, although they get one free to start with. More can be unlocked from the in-game cash shop for a reasonable price of in-game currency called Favor. 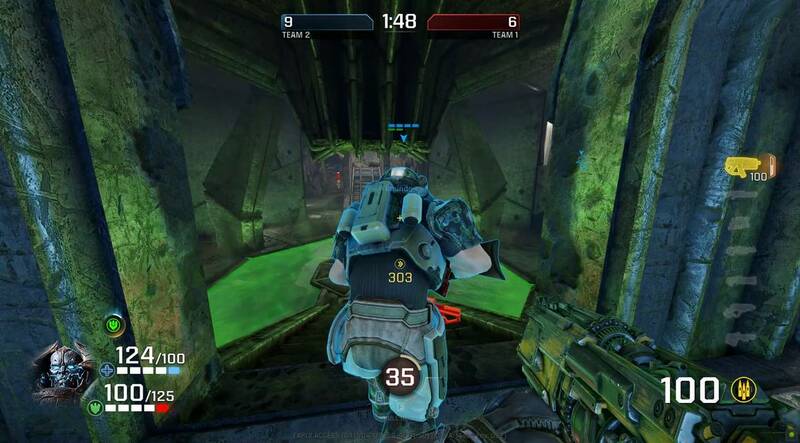 Matches boil down to teams of four going against each other and the objective is to get your team's kill count higher than the opposition's before the time runs out. That's why Team Deathmatch is an insane action packed mode because of the frantic and frenzied nature of the objectives. 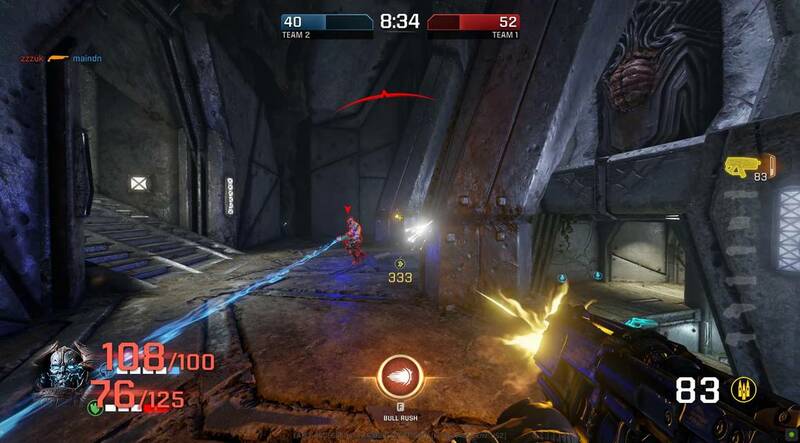 Gameplay is also refreshing and unlike other FPS titles as movement is faster, and players will rely on picking up power ups scattered around the map. These power ups offer increased Armor, Health Regens and other good boosts. You will also find better weapons around the map that you can swap to do some hard hitting damage. 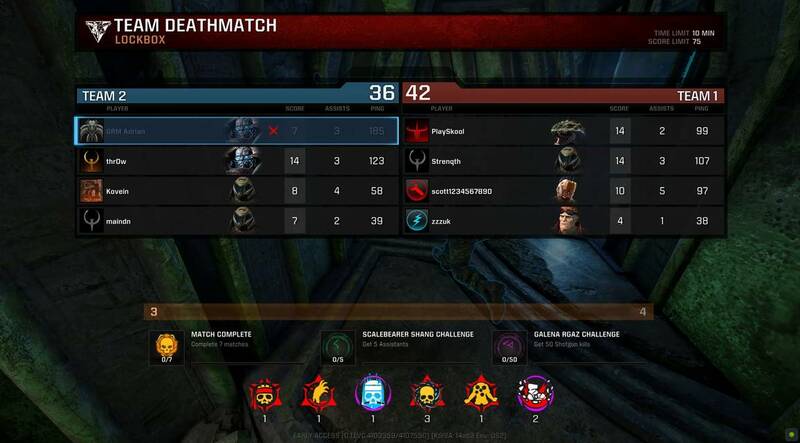 In a way, it does make Quake Champions almost a selfish team-shooter, because power ups and weapons are first come first serve, so everyone is out for themselves before their team mates. 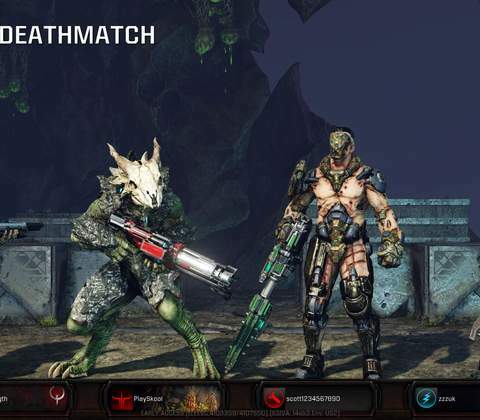 The other match modes includes all out Deathmatch where there are no teams, and much later on you can access Arcade Mode that adds another layer of fun match modes that aren't common for FPS games. For the more competitive player, Ranked mode unlocks at a higher level and offers a more serious environment to get your name up on the leaderboards. The gunplay is fast, furious and addictive. The gunplay in Quake Champions is very authentic to its earlier titles in the franchise. Accuracy goes to hell, and it's all about making as many hits matter using a combination of multiple weapons at your disposal, especially Champion Abilities. As each Champion on the roster has unique abilities, they are incredibly useful and situational making them hard to master. But that's what keeps matches interesting, as abilities can turn the tide of a match when used right. Some Champions and their abilities are more sought after than others of course, and balance can be an issue but for non competitive play it doesn't really matter. However, that doesn't mean that guns and weapons are useless. On the contrary, each weapon in-game that you'll come across feels different with many strengths and weaknesses that you'll get used to over time. For example, Shotguns are amazing for close-range frags, while the Rocket Launcher is excellent for disposing enemies clustered together if you time it right. More than most FPS games though, players aren't going to make it easy for you by just standing there. Expect to see plenty of movement and jumping around, so if you're not doing the same (while shooting back) then expect to be dead. 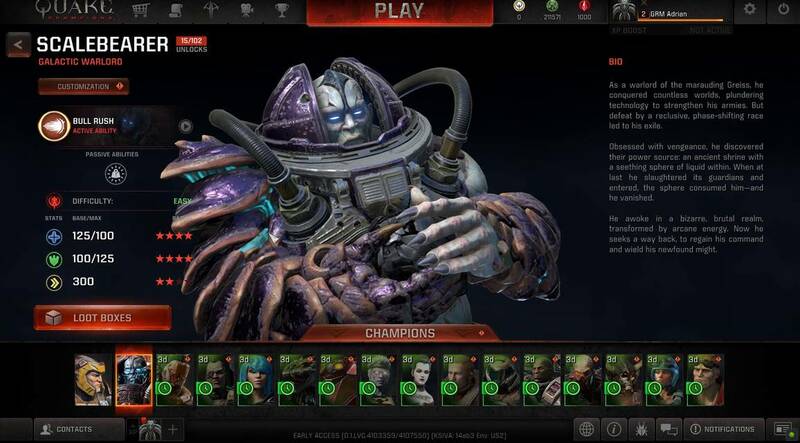 As for the roster itself, there's currently over a dozen unique Champions, and some of them players will recognize from other iconic Bethesda games, like the Doom Guy from Doom. The roster feels large enough for new players in the near future, but we'd definitely like to see more added over time to enhance the replay value of the game. It looks good in presentation, sounds good too with all that rock music, but more importantly the gameplay is ridiculously fun and addictive, especially for fans of the Quake Franchise. From profile ranks to Champions and customization, there's plenty of things to do. Where Quake Champions truly shines is with offering players a ton of in-game goals to achieve. Firstly, playing matches and doing well rewards your profile Rank with XP. The higher that goes, the more game modes you unlock. Therefore right off the bat, there's a real sense of progress and reward here which is better than locking more content behind a pay wall. Additionally, the game also awards you Lootboxes and other goodies from winning or losing matches in addition to currency to spend in the cash shop. 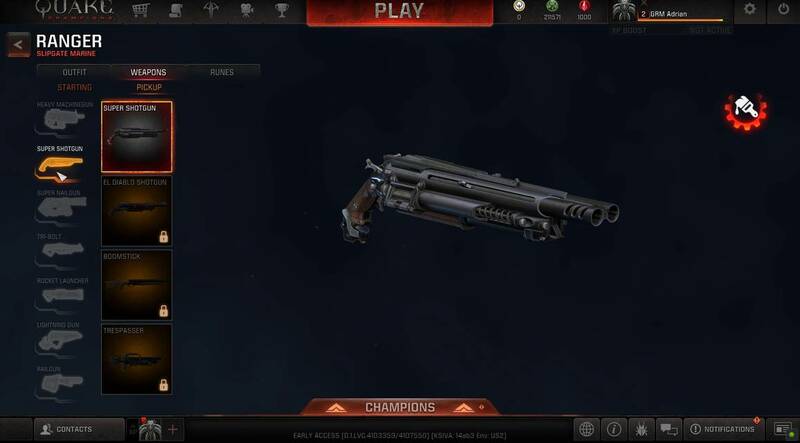 There isn't a winner or loser ultimately, as every player is eventually getting something tangible for just playing Quake Champions. During matches itself, more can be done to progress your profile. 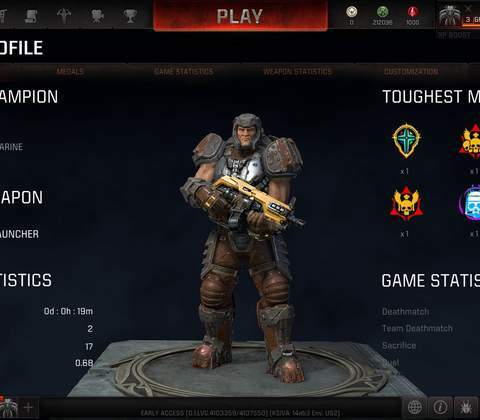 Quake Champions has a fun achievements and medal system to highlight your gameplay feats. Killing a player who recently killed you gives you the Revenge medal and achievement, which is then read out loud in-game and will be pinned to your public profile page for bragging rights. It's a nice ego booster seeing all your medals neatly displayed on your page. Additionally, logging in every day during the week rewards you with freebies as well, which is a good way to retain players. Daily missions and tasks are also available, to give players something to work towards casually if they chose to do so for rewards. Other fun progressions include unlocking more customizations for all the weapons and outfits for player Champions. This will take longer than most other FPS games because they rely on drops from Lootboxes and Crates, unless you'd rather spend money in the store. But the key thing to note is that customization is just cosmetic, and has nothing to do with altering in-game stats. Therefore, Quake Champions is completely non-pay to win in that regard. Is Quake Champions Worth Playing? If you're into frantic FPS games then the answer is yes. 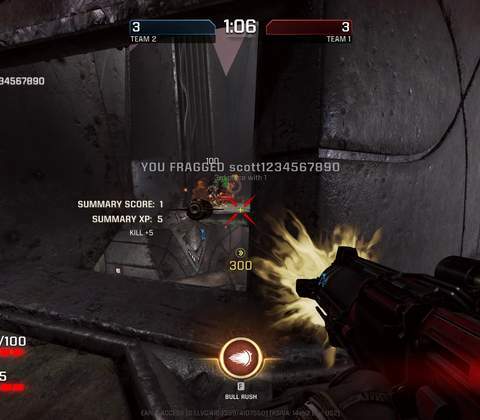 For a free to play game, Quake Champions offers some top notch gameplay that's unmistakably AAA in design. 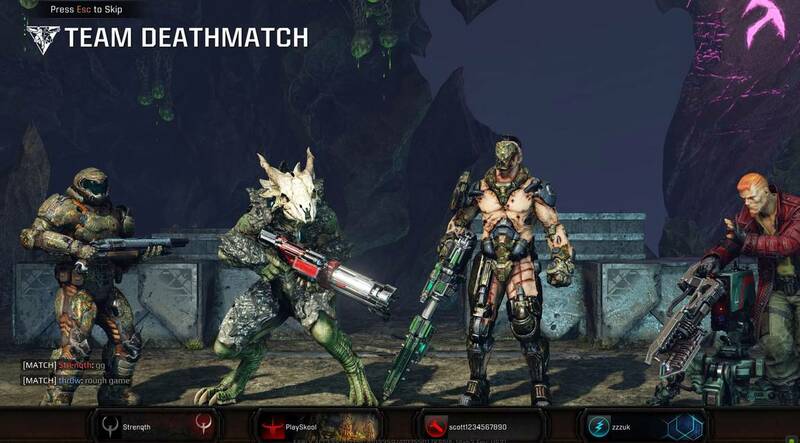 It looks good in presentation, sounds good too with all that rock music, but more importantly the gameplay is ridiculously fun and addictive, especially for fans of the Quake Franchise. There's more than enough progression systems to keep you hooked, especially if you're on the path to unlocking more gameplay modes or more Champions to play with. Overall, Quake Champions is a solid FPS title and it's one we'd recommend if you're in the market for a high quality free to play shooter. 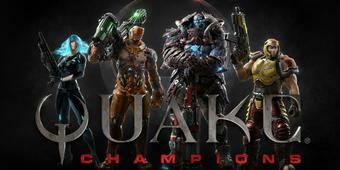 Ready to enter the world of Quake Champions? Click here to play now! 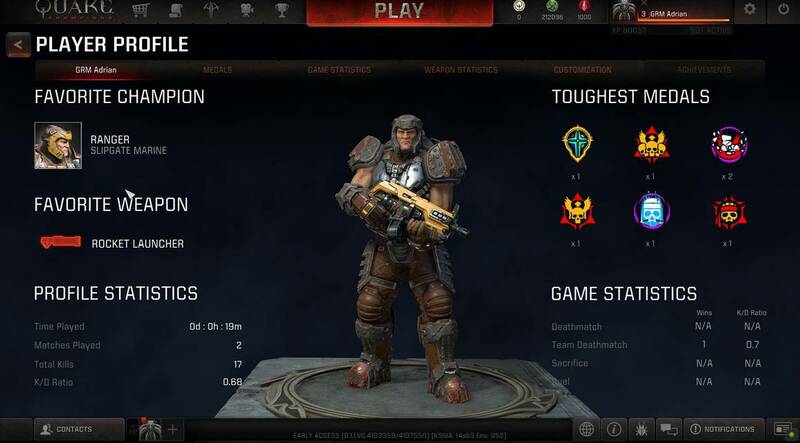 Quake Champion's originality is its legacy - it's an authentic Quake game that offers that familiar frantic gameplay, power up manipulation and take no prisoners Champions that we've all come to love over the years, but this time in a free to play game that's fair and rewarding.